Discover how to align your best-self, with your meaningful purpose, with this experiential workshop. Discover and develop a personal manifesto that will “energize” every cell in your body. 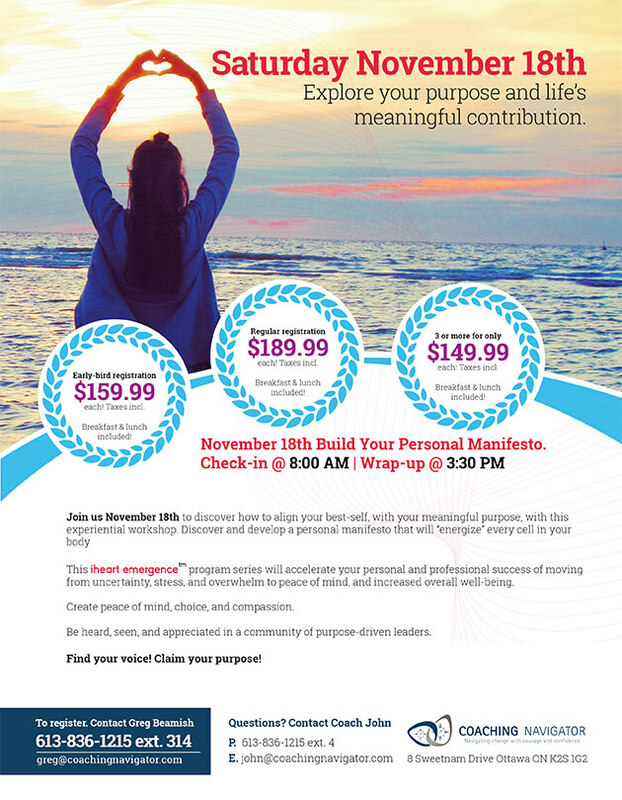 This iHeart Emergence program series will accelerate your personal and professional success of moving from uncertainty, stress, and overwhelm to peace of mind, and increased overall well-being. Categories: Register, Training. Tag: Personal Manifesto Nov 18 2017. $149.99 ea. when you register 3 or more at once! Join us November 18th to discover how to align your best-self, with your meaningful purpose, with this experiential workshop. Discover and develop a personal manifesto that will “energize” every cell in your body. Create peace of mind, choice, and compassion. Be heard, seen, and appreciated in a community of purpose-driven leaders. Find your voice! Claim your purpose! heart emergence is an interactive facilitation training workshop. Participants learn, and practice in class and leave with experience of the process. Including snacks and a delicious lunch.